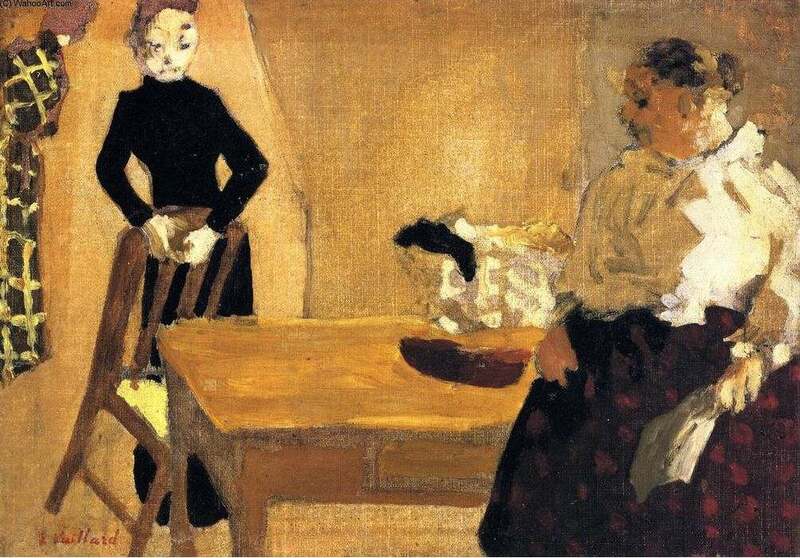 The typical work of Edouard Vuillard (1868-1940) is characterized by intricacy of design and richness of color. This early piece (painted when he was about twenty-three) is more economical than most. The striking thing about it is the boldness and variety of its shapes. Look at them one by one: the dress on the wall (if that’s what it is), the daughter with the chair, the table, the central chair (if that’s what it is) with fabric draped over it, the mother. Each is drawn as a simple shape directly onto the honey-toned canvas. The daughter is so bold and contrasty that she balances the larger but simpler shape of the mother. The shadow side of the mother’s blouse is the almost untouched honey ground, which integrates her with the background and keeps her from sagging out of the right side of the composition. And that busy little black shape on the chair–picture how soft the middle would be without it, and how hard it would be for the eye to jump from one side to the other. The shapes are not only lively in themselves, but leave lively negative shapes around them: start in the lower left-hand corner and meander up between chair and dresses to left and right and face, to the top of the canvas. * Some elements (the bent gray line by the daughter and the splotchy gray bit around the mother’s head) save the background from shapelessness, but they seem to be improvisations of convenience, with no obvious descriptive basis. The only direct depiction of light is on the mother, but that’s so convincing that the whole image seems to glow. Convincing but not realistic: the daughter is a flat shape, and neither the mother nor any other shape throws a shadow. There are clunky bits–the hands, for example, and the soupy tabletop–which Vuillard is confident enough to leave, rather than going back to retouch, and risk overworking. Altogether, a bold, adventurous work.